Various styles of environmental protection bags, to meet different needs. According to the special requirements: customized bags, thermal bags, silver surface bags, green Shopping Bags. According to different age levels, bags can be divided into the following categories: cartoon-type bags for some children, simple type of green bags for like simple friends, and DIY bags are suitable for some like design friends, custom-designed Of the bags are suitable for a number of companies supporting the sale of his products to achieve the effectiveness of publicity. Environmental non-woven bags (commonly known as non-woven bags) is a green product, tough and durable, beautiful shape, good ventilation, reusable, washable, silk screen advertising, long use period, suitable for any company, any industry as advertising , Gifts purposes. First, the non-woven shopping bags more economic effect From the plastic limit issued by the beginning of Plastic Bags will begin to gradually withdraw from the packaging market, replaced by a reusable non-woven shopping bags. Non-woven bags than plastic bags in terms of easier to print patterns, more vivid color expression. Plus can be used repeatedly that can be considered in the non-woven Shopping Bag with more beautiful than the plastic bag pattern and advertising, because the repeated use of less than the loss rate of plastic bags, resulting in non-woven shopping bags but more cost savings, And bring more obvious advertising effectiveness. 4. Low price, easy to promote. As we all know, environmentally friendly shopping bags to attract people's place is that it can be recycled, durable and inexpensive; and environmentally friendly wine bag manufacturers to attract economic benefits, can improve the economic efficiency of enterprises, while custom-made green wine bag Marked with the product of advertising, play a certain publicity effect. Although, in some environmental forums or communities, users of environmental protection shopping bags mixed. However, through a number of environmental public welfare activities or some environmental organizations, environmental protection bags in people's daily life, the more important position. However, in the meat market, some aquatic products, fruits and vegetables, if the direct use of environmentally friendly bags, then it is not convenient. Because the bags are used every time cleaning, it takes time. This is why the market in the meat, the bags are not very popular reason. In this connection, "plastic limit" can not be thoroughly implemented. The design of the bags needs to be improved, as well as to adapt to the use of various occasions. Environmental protection completely replace the paper bag or plastic bag road is still long! The traditional plastic bag shopping bags, in order to save costs so thin material, easy to break. But if in order to make him stronger, is bound to be more cost. The emergence of non-woven shopping bags to solve all the problems, non-woven shopping bags, toughness, not easy to wear. There are a lot of non-woven shopping bags covered with film, but also has a solid, the more waterproof, feel good, beautiful shape a bit. Although the cost of a single plastic bag up a bit, but its service life can reach a non-woven shopping bags hundreds, or even thousands of plastic bags on the million. 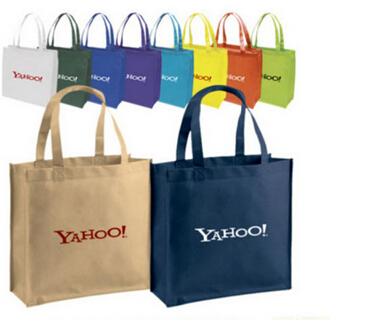 A beautiful non-woven shopping bags, not just just a commodity bag. Its beautiful appearance is more attractive, can be transformed into a stylish simple shoulder bag, a beautiful landscape of the streets. Coupled with its inherent waterproof, non-stick hand and other characteristics will become the first choice for customers to go out, in such a non-woven shopping bags, you can print your company logo or advertising, the advertising effect will not bring Self-evident, the real small investment into a big return. Plastic limit issued, is to solve the problem of environmental protection. Non-woven bag overturned use, greatly reducing the pressure of garbage conversion. Coupled with the concept of environmental protection, more able to reflect the image of your business, and the People First effect. Thus bringing the potential value of more than money can be replaced.